Bec and Brett Clarke with a Coomera River Bull Shark that Bec caught. 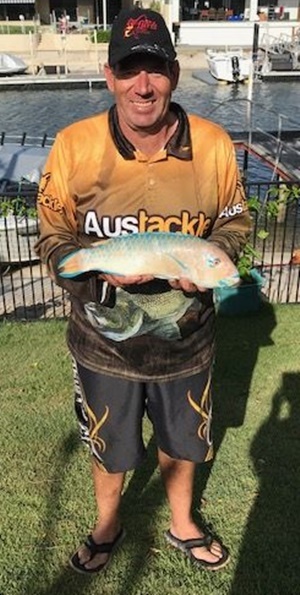 Rodney Taylor with a pretty Parrot Fish from the Broadwater. 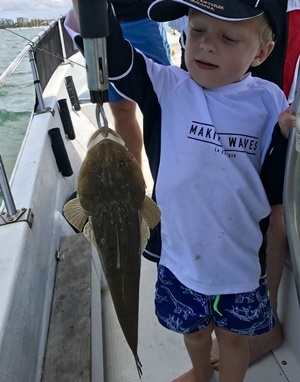 Harry caught a Bartail Flathead in the Broadwater with Brad Smith Fishing Charters. 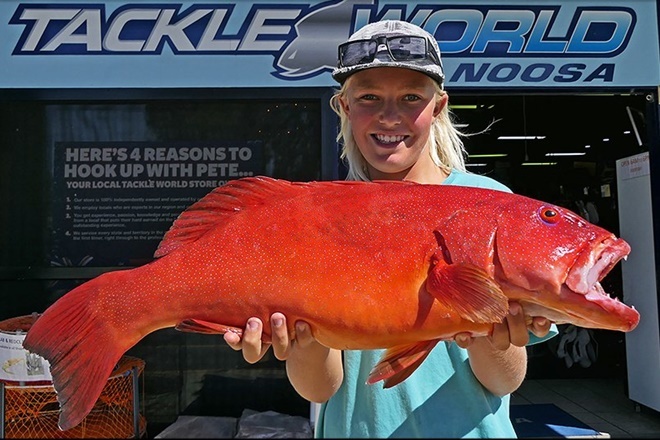 Riley Morgan landed a nice tarwhine on his first trip in a boat. Hi Everyone, hope you’ve all had a great week, hot Northerly winds combined with big tides has made fishing a bit hard at times. Picking a good spot out of the wind has been the key to success. Let’s see what’s been biting. With the weather warming up, chasing Bull Sharks is a great option during the summer months. 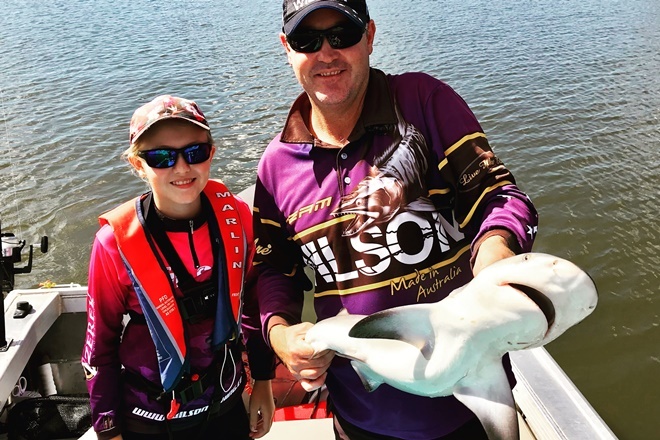 Coomera Bait and Tackle customers have been finding a few nice Sharks during November. 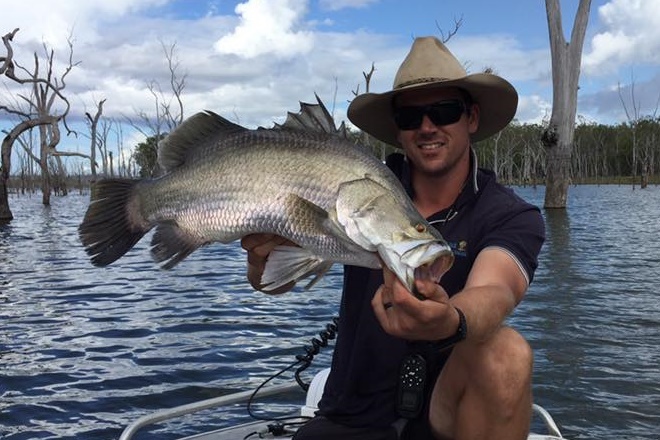 Some of the more popular spots to try which can be accessed land based or by boat are the Coomera River, Jacobs Well, Logan River and Nerang River. If you have a boat the Aldershots, Jacobs Well, Tiger Mullet Channel, Crusoe Island and Wave Break Island all produce good numbers. I recommend getting a burley trail going to attract your target, WA pilly or Garfish cubes have worked well for me. My first choice of bait is Freshwater Eel as it is as tough as nails and doesn’t get picked at by small fish or destroyed by Mud Crabs. A nylon coated wire trace is essential, my trace length is determined by the size of sharks I am targeting, keeping in mind in Queensland that sharks have a legal maximum length of 1.5m and a take limit of 1 Shark per person, any larger Sharks must be released https://www.qld.gov.au/recreation/activities/boating-fishing/rec-fishing/rules/limits-tidal#sharks. Most anglers these days prefer to use a Circle hook to look after the Shark. You can use a J style hook just don’t let them play with the bait too long and you should get a good jaw hook up which makes releasing the Shark a lot easier. You can try to vary where you set you baits by using a float on one bait and a sinker on another to find what method is working best in the area. 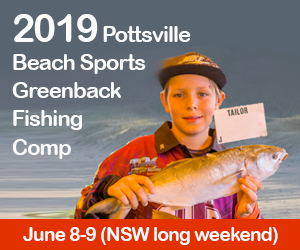 Live bait is great like Mullet, Pike or a legal sized fish like Whiting or Bream, Mullet Fillet or whole Mullet works well as a dead bait option. Just keep in mind your target has a mouth full of razor sharp teeth and will jump from the water at times during the fight so general safety is very important. 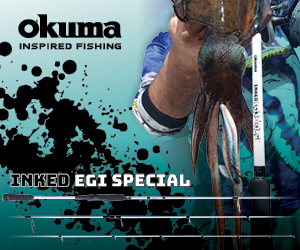 We stock a great range of Tackle and Fresh Water Eel at Coomera Bait and Tackle. 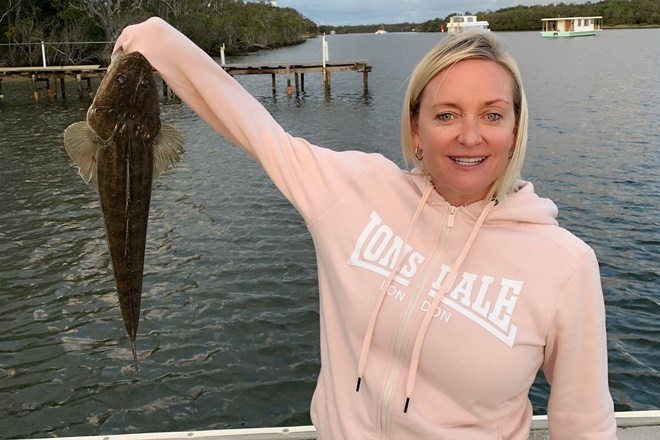 Clint from Brad Smith Fishing Charters has reported Brad has been finding some quality Jewfish, Flathead Bream and Bass on lures in the upper reaches of the Tweed River. Clint has been doing well in the Broadwater finding a good mixture of Whiting, Flathead, Tuskfish and Trevally for his customers. 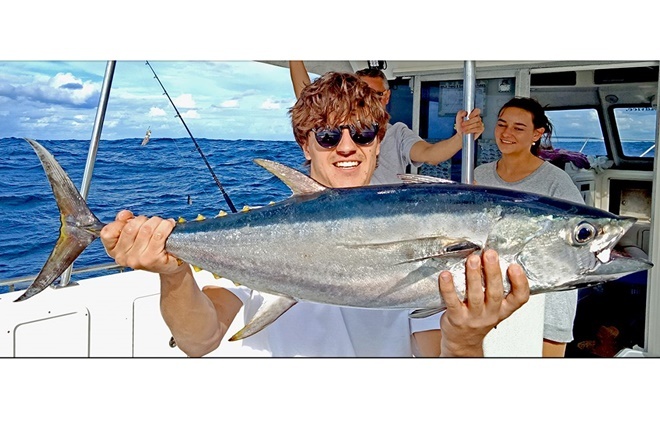 The Gold Coast seaway Pipeline has produced a few nice Jew Fish and Trevally this week, drifting through the Seaway and in the main Broadwater channel is also a good option. Live Pike, Herring or Mullet are great live baits. Large Zman Plastics, Micro Jigs and Switch Blades will do the job. Best to fish this area the hour before and hour after the tide change when the tidal flow slows down. 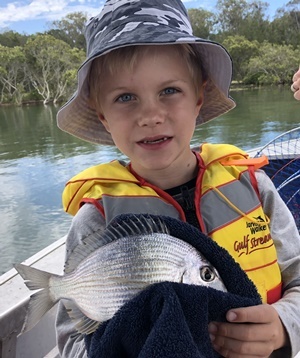 Coomera Houseboat Holiday customers have landed a feed of Bream and Whiting using Yabbies and Worms for bait. The Sandbanks around Wave Break Island, Crab Island, Paradise Point are fishing well, Bream and Whiting are not really affected by boating traffic and noise like other species. Some other good spots are Jacobs Well Shoals, Coomera River, Tiger Mullet Channel, Bedrooms, Canaipa Passage and the Logan River. At the time of writing my report the forecast looks like we will see light S/SE winds on Friday and Saturday. Sunday will see the wind swing N/NW and increase as the day goes on. I always recommend you have the latest weather report before you head out on the water.